How an artist politics affect his memory. 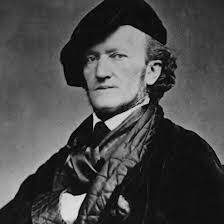 For those of you who don’t know the person in this picture this is the German composer Richard Wagner. This man has many great achievement among them changing the face of Opera. Before Wagner, opera houses were always had the lights on during any performance, the orchestra was also in plan view. He basically changed the format of the opera house by turning it into a movie theater in a way. The lights were off during a performance, the orchestra no longer in the open but creative hidden to make the sound resonate through out the theater. He also wrote the Der Ring des Nibelungen, four operas linked together, they take around 18 hours to perform. But you are wondering about the politics. He was part of a group that believed all the princes of what ended up making Germany should be done away with. He ended up in exile because of his belief but oddly enough he was rescued by the King of Bavaria. Without that rescue he may never have written the Ring Cycle. He was also an outspoken as an antisemitic. He believed that his music would inspire National pride in Germany. When Hitler came to power he was inspired not only by the music of Wagner, but also because of Wagner’s persona beliefs he chose to use much of Wagner’s works to inspire the Germany Nation. Now a days there are many people who do not like Wagner’s music because of how it was used by Hitler and because of his own attitudes towards the Jews. A man who changed the course of Opera, theater and in some ways had an impact on how movies are viewed today, now goes by the wayside because of his political views and who he was later associated with. Just a piece of history.